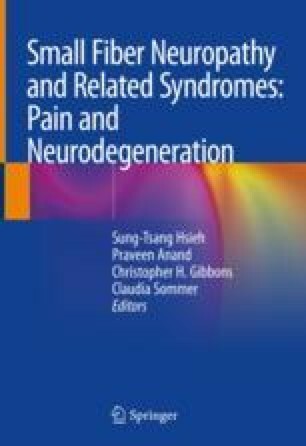 In peripheral neuropathies with sensory ataxia or weakness of distal limbs, traditionally nerve conduction studies are the first-line tests, and these neuropathies are classified as large fiber neuropathy including (1) inflammatory neuropathies of Guillain-Barré syndrome (GBS), chronic inflammatory demyelinating polyneuropathy (CIDP), and polyneuropathy associated with organomegaly, endocrinopathy, monoclonal gammopathy, and skin hyperpigmentation (POEMS), (2) hereditary neuropathies of Charcot-Marie-Tooth (CMT) disease encompassing different genotypes, and (3) chemotherapy-induced peripheral neuropathy (CIPN). Patients with this phenotype of large fiber neuropathy frequently have symptoms and signs suggesting small fiber involvement, i.e., small fiber nerve degeneration and functional impairment. With the applications of skin biopsy for measuring intraepidermal nerve fiber density (IENFD), quantitative sensory testing for assessing thermal thresholds, and autonomic function tests for examining sympathetic and parasympathetic axis, concomitant small fiber pathology and functional impairment (small fiber pathology or syndrome) were documented in some of these neuropathies traditionally considered as pure large fiber neuropathy. Not only serving as a criterion of small fiber pathology, parameters of small fiber examinations also provide a surrogate marker of disease activities and progression reflecting generalized ambulation difficulty and correlated with patient-reported outcome measure of quality of life. Oaklander AL, Lunn MP, Hughes RA, et al. Treatments for chronic inflammatory demyelinating polyradiculoneuropathy (CIDP): an overview of systematic reviews. Cochrane Database Syst Rev. 2017. https://doi.org/10.1002/14651858.CD010369.pub2. Zirpoli GR, McCann SE, Sucheston-Campbell LE, et al. Supplement use and chemotherapy-induced peripheral neuropathy in a cooperative group trial (S0221): the DELCaP study. J Natl Cancer Inst. 2017;109(12). https://doi.org/10.1093/jnci/djx098.